One of the great things about having more space in my workshop is that I can try out different silversmithing techniques. Since I have the place nearly set up I’ve decided to try my hand at acid etching. Acid etching is the process of using acid to cut into the unprotected parts of a metal surface to create a design. I plan to acid etch on silver but it can also be done on copper or brass. 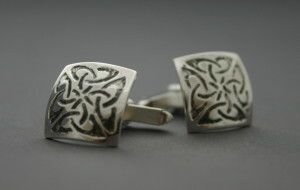 The chemical used to etch into silver is Ferric Nitrate. It comes in crystals that are then mixed with water. The silver is cleaned and the resist (protective coating) is painted on leaving areas exposed to form the design. You can use lots of things as a resist. I will be using things like permanent markers, nail polish and brown tape. Once this is done the silver is submerged face down in the ferric nitrate solution and the acid goes to work eating away at the exposed silver. The design will be made deeper depending how long you leave the silver in the solution, so it is usually checked every 30 minutes. (Picture credit). This little experiment isn’t going to be like one of those cookery demonstrations where after a little feeble mixing they declare here’s one I made earlier. If this doesn’t work you’ll see the pictures to prove it, so wish me luck! I’m going to gather everything I need over the weekend so I should be ready to start next week.